….Kill ALL the Things? No, But I Might Trade Our Shiba Inu for a Pepsi Maxx! Are You Talking about Me? You MUST Be Talking about Me. I’m the Only Shiba Inu Here! During our first Whole30, I relied heavily on the official #Whole30 Timeline 2.0 available on the Whole30 website. The timeline served as a sort of roadmap, reassuring me that I was more or less staying on course and that my struggles were normal, especially during the difficult days. This time is no different. The following is an excerpt from the official #Whole30 Timeline 2.0 for days 4-5. In all honesty, I probably entered this second go-round a tad over-confident, and my recent pre-Whole30 diet hasn’t been as clean as I’ve been telling myself. As I’ve written previously, we’re prepping for our daughter’s first birthday party. And I’ve been using the upcoming celebration as an excuse to test out several new cookie recipes including my pretty Pink Paleo Macaroons and not-yet-published Paleo/Vegan Magic Cookie Bars recipe. Truth is, I probably ate cookies (plural, as in more than one) every single day in August. I’d also resumed the nasty habit of consuming 1-2 diet sodas daily, and boy am I paying for it now! My body is seriously craving sweets and caffeine. I’m suffering from major headaches, brain fog and irritability. 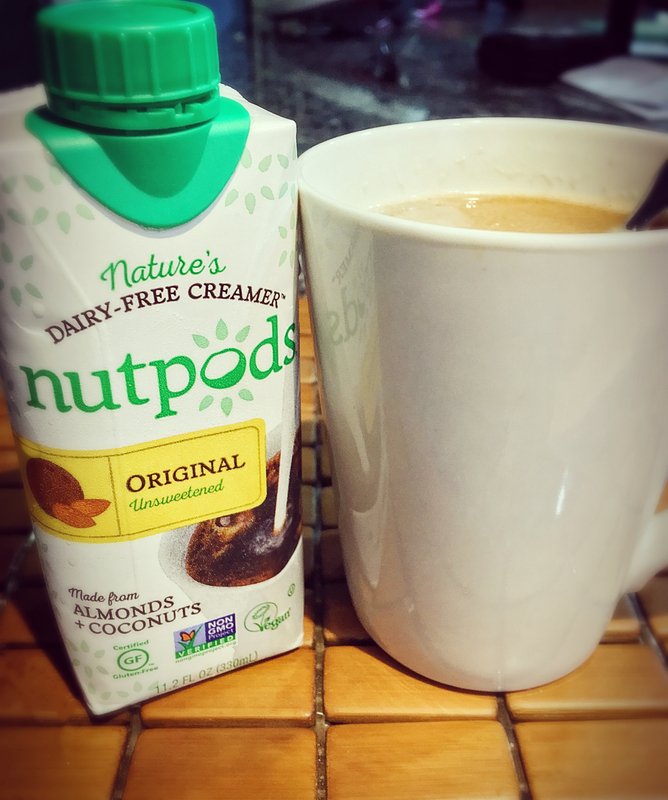 Mercifully, this round is MUCH easier thanks to the recent Whole30 approval of Nut Pods Unsweetened Coffee Creamers! Even Whole30 Mamas Need Caffeine!!! I’m not homicidal. Thank goodness! But I am seriously lacking (my normal) patience for dealing with our dogs, especially our poor Shiba Inu, CJ. Poor CJ. He such a sweet boy…most of the time. He adores our baby girl. But sometimes that’s the problem. 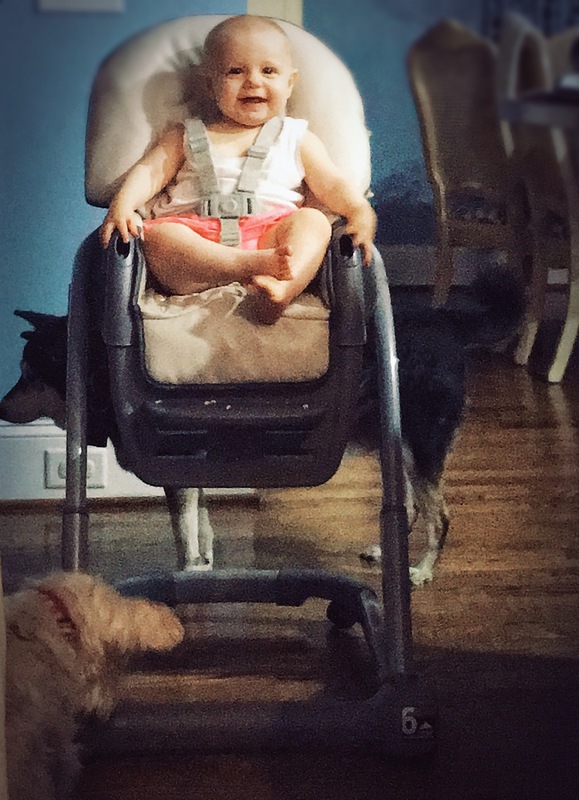 He’s constantly circling around her, especially now that she’s attempting to eat solid foods. 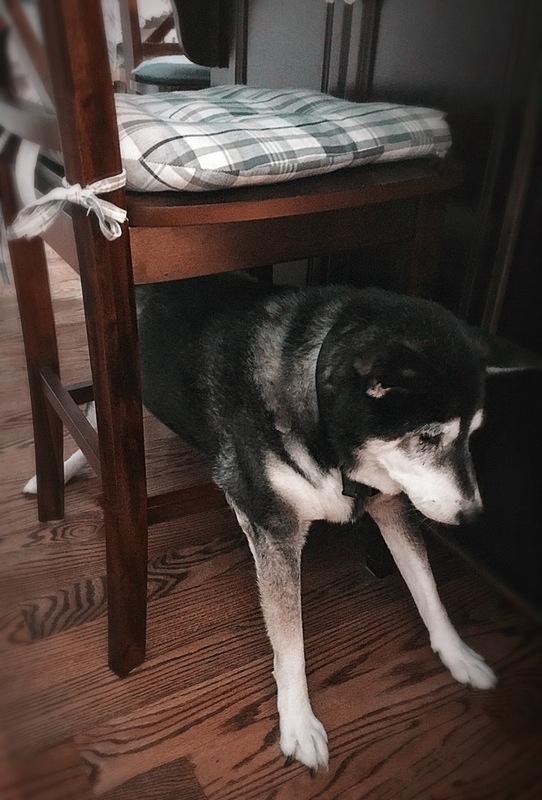 He’s always underfoot as he forages around her highchair for her droppings. And CJ tends to bark repeatedly every time I get the baby down for her afternoon nap. So frustrating! 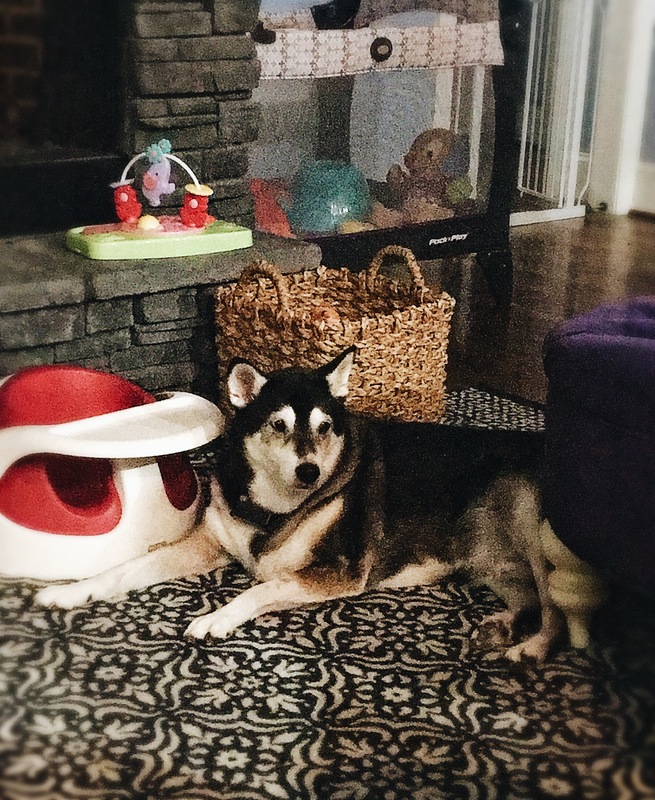 I then find myself barking (shouting) back at him to “shut up, you’ll wake the baby,” which of course wakes her up immediately making me even more frustrated, mostly with myself for having an argument with a dog. Luckily (for CJ’s sake), the Whole30 folks state that this phase doesn’t last. And, I’m doing my best to remind myself that I made it through these rough patches last time and the rewards are more than worth the discomfort. So, I’ll have another cup of Nut Pods-spiked coffee and look forward to some yummy (leftover) rotisserie chicken stir fry for dinner, one of my favorite recipe discoveries from our first Whole30. 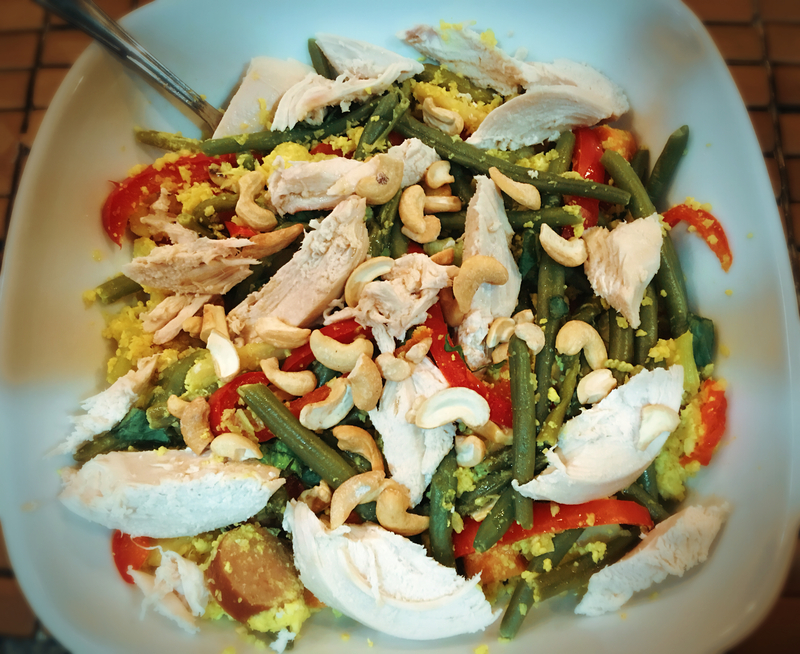 This entry was posted in Gluten-free Recipes, Habits & Patterns, Health & Wellness, Whole30 and tagged #COFFEE, #glamlifeguru, #JERF, #momlife, #nutpods, #PALEO, #WHOLE30, #whole30approved, #whole30round2, Primal. I have written previously about my love for cooking with all iterations of coconut oil. Vegetables, in particular, seem to respond deliciously to a hearty helping my fav oil and hefty doses of heat and salt. The result is almost always crispy green yumminess that rivals any bagged potato chip I’ve ever tasted. But coconut oil’s uses are not limited to cooking. A fact of which you are no doubt aware, if you frequent online beauty sites (for example: Pop Sugar, Total Beauty, etc. ); follow any health or beauty-related YouTube Vloggers (e.g. FitLifeTV, JenerationDIY, and MANY more); or really have spent any amount of time online recently. Coconut oil is trending as the magical multi-purpose oil touted as everything from shaving cream (messy but reasonably effective in my experience) to leave-in hair conditioner (works well but I’d suggest only applying from mid-shaft to ends and not roots to avoid limp, greasy hair) to cure-all for eczema and lice (thankfully, can’t speak to its efficacy for those particular afflictions…yet). Instagram alone offers a dizzying array of coconut oil-based DIY facial scrubs promising to eliminate old acne scars, age spots, fine lines and cellulite; guaranteed to leave you with smoother, brighter, younger looking skin. Wow! All that, and crispy delicious brussels sprouts, too. Truly amazing! Well, I’m here to tell you about 2 uses for coconut oil not previously mentioned in Internet Land. #1. Caring for sensitized baby skin – From an aesthetic perspective, there’s not a lot to “correct” about baby skin. But infant skin can be very fragile and reactive, especially during transitional periods or bouts of illness. My daughter is now 7 months old. 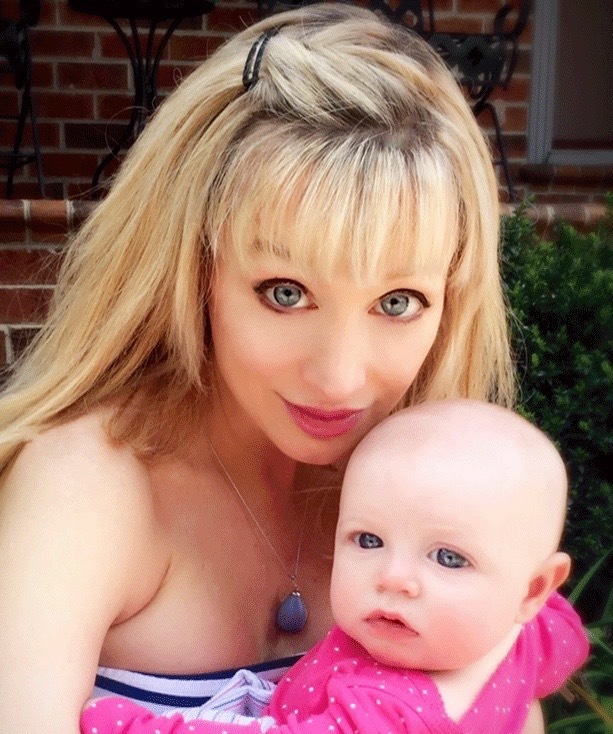 She inherited her father’s fair, sensitive skin and allergies (see pic below). She’s also teething, i.e. drooling a lot. When she developed her first ever cold a few days ago (and the runny nose, congestion and sinus drainage that goes along with it, cue sad Mommy face), the combination of factors resulted in an itchy irritated rash on her face, neck and chest. Fortunately, we keep a bottle of fractionated coconut oil spray on the changing table (as I’ll explain below). We just spray a little on a clean facial tissue, then wipe her face, neck and chest twice per day. Following this regimen, the rash resolved within 72 hours. Obviously I’m thrilled that the rash healed so quickly, but I’m especially pleased that she no longer seems so uncomfortable. Also, it’s reassuring to know that if she gets any of the oil in her mouth (and she puts EVERYTHING in her mouth right now), it is nontoxic, chemical and preservative-free unlike any other facial/baby wipe we may have used and unlike any cosmetic or medicated cream or ointment. Daddy & Baby – both use coconut oil to soothe their sensitive skins. Swoon! #2. 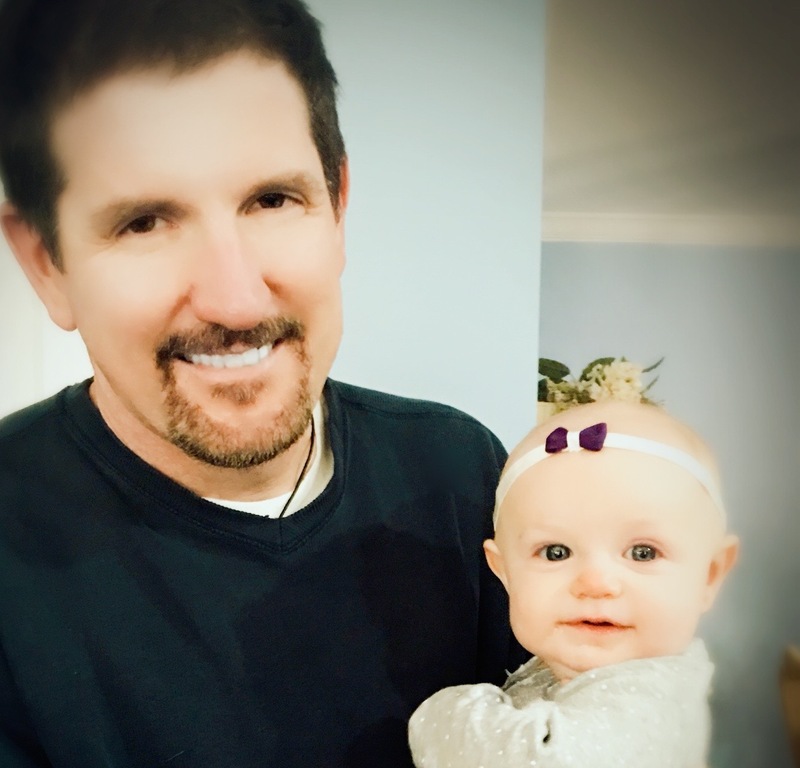 Coconut oil is a phenomenally effective baby poop cleaner-upper (yep I’m going there) – As I said my daughter is teething. She’s also beginning to eat some solid foods, and she’s had this mucus-y cold. All these things combine to produce some very sticky, icky, tough-to-clean-up poopy diapers. Enter the magic fractionated coconut oil spray. A few simple spritzes of the miraculous spray oil before “going in for the wipe,” and cleanup time is easily cut in half, maybe cut down by ¾. It cuts right through the “mess,” allowing Mommy or Daddy to tidy up the area quickly and with far fewer wet wipes, saving time and money, and parental exposure to toxic ickiness. 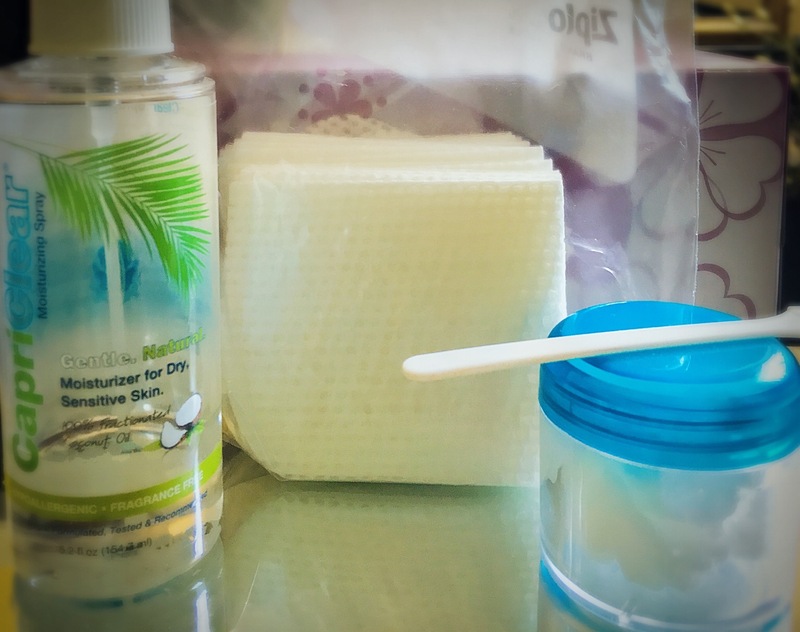 Various coconut oil treatment options from darling daughter’s changing table. So now that I’ve offered you a whole new (terrifying?) perspective on the varied uses for and amazing powers of this extraordinary oil that brings happiness to so many, allow me to bring the subject back full circle to food – to a deliciously warm, chocolately and satisfying blender drink. Too soon for that image? I hope not, because I’m talking about COFFEE! As every mother knows, it’s always okay to talk about baby poop – to talk about almost anything – as long as there’s coffee. 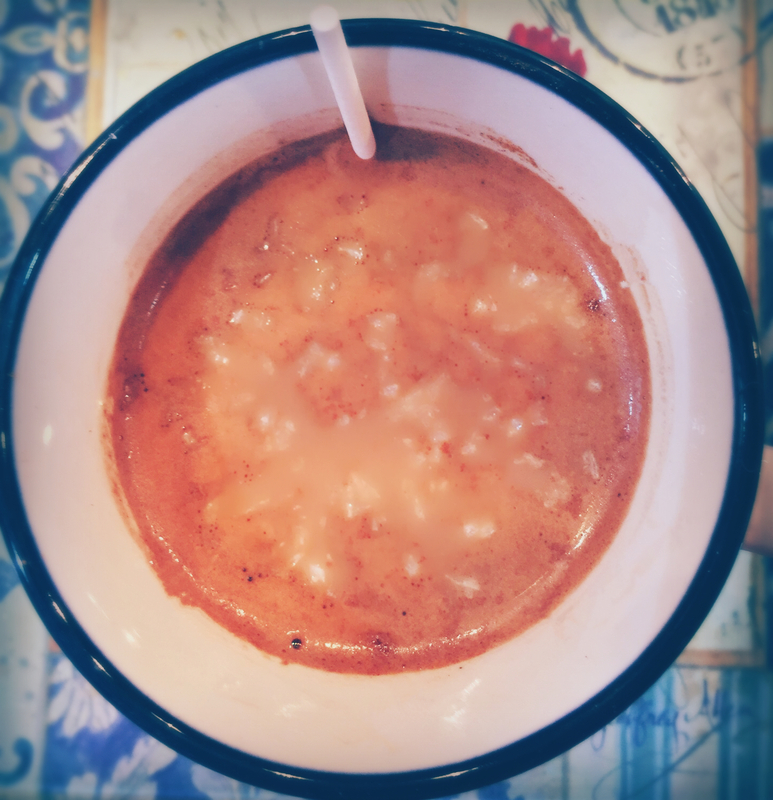 From chemical-laden to coconut goodness – coffee bliss at last! 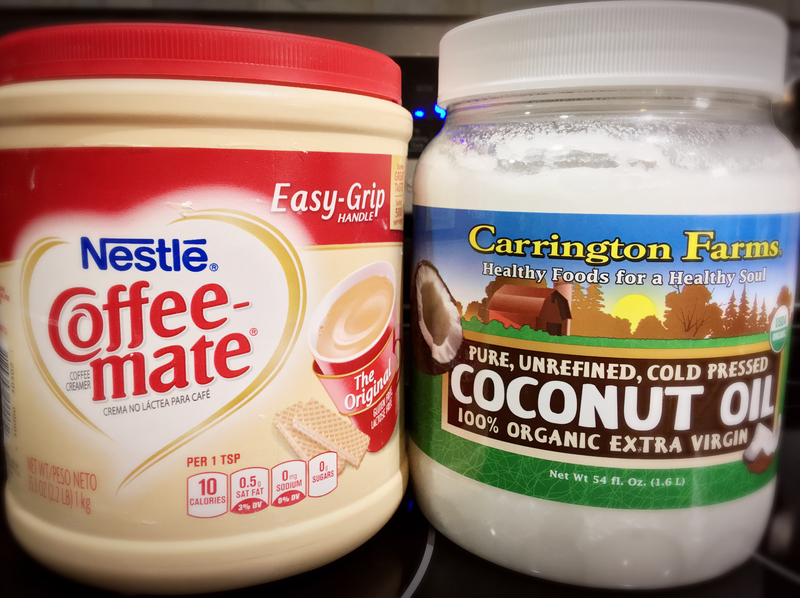 Back story – I wrote about my struggle to let go of artificial (powdered) coffee creamer at the beginning of our WHOLE30 journey and again mid-way through the program when I realized the powdered chemical-laden gunk was delaying my progress. Though Hubs’ iced option kept me caffeinated and headache-free, I never found a truly satisfying alternative. Then, a few days after completing the program, I discovered the fabulous Coconut Mama. The Internet has long been a-buzz with the promise of multiple benefits from what has been termed “Bulletproof Coffee” see also slide #2 in this Total Beauty slide show. Now, I haven’t touched dairy in any form for years, so the idea of adding (even) grass-fed butter to my all-important coffee seemed downright sacrilegious to me (and though WHOLE30 allows for the use of clarified butter, I’ve been – quite frankly – too darned lazy, and still too dairy-averse to even go there). Plus, I’ve always wondered – if the active ingredient is the MCT oil, why not forgo the butter and just use an oil that’s high in MCT fats to begin with, i.e. coconut oil? So several years ago I tried adding coconut oil to my coffee but was left with a very unappetizing puddle of oil sitting atop my cup, leaving me with no choice but to pour out my otherwise pristine caffeinated cup o’ goodness. 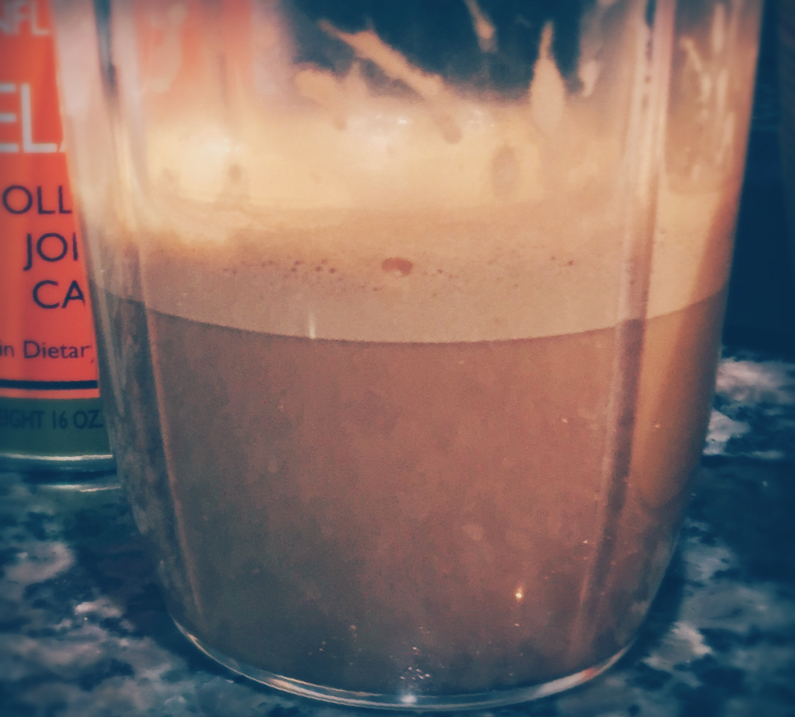 So when I stumbled upon Coconut Mama’s recipe for coconut oil coffee, it rocked my world (or at least my AM routine)! What follows is my own adapted version of Tiffany’s (AKA “The Coconut Mama’s”) recipe. Hubs and I now choose this option regularly for our coffee (hey we’re trying to keep up with a teething 7 month-old after all), and it’s been a wonderful switch! I hope you will enjoy it as well! 1. Carefully pour hot coffee into your blender cup. 2. Add coconut oil and any other flavorings or sweeteners you’re using. Stir briefly to combine. 3. Place the lid on your blender then blend up your coffee. The result will have a nice frothy “head” like a fancy coffee shop drink (see pic below). Once blended, pour it into your cup. I like to sprinkle mine with unsweetened shredded coconut (because, can you ever have too much?). • Feel free to use any approved spices you enjoy! (For the Lord has sent me) …to proclaim the year of the Lord’s favor and a day of vindication for our God, to comfort all who mourn, to provide for Zion’s mourners, to give them a crown in place of ashes, oil of joy in place of mourning, a mantle of praise in place of discouragement. The fabulous Coconut Mama offers free e-book with recipes using coconut flour that are sure to please any coconut aficionado (or fanatic such as myself). This entry was posted in Beautiful Basics, Beauty Product Reviews, Beverages, Blessed Baby, Pretty Food, Vegan Recipes, Whole30 and tagged #BABYPRODUCTS, #COCONUTOIL, #COFFEE, WHOLE30.